I had this tweed jacket made by South Korean house B&Tailor over the past 18 months, using Robin Petterson - a Swede who does their fittings in London and at home in Stockholm. Unfortunately, although the end result isn’t too bad (just a couple of outstanding issues) the process has been pretty poor - it took five fittings to get to this stage. I originally met Changjin and the rest of the B&Tailor team at our Young Tailors Symposium back in June 2016. Sponsors Holland & Sherry offered to pay for a suit with them (or jacket and trousers in this case) in order to cover the service, and B&Tailor measurements there. We had the first fitting that Autumn, when Robin was in London for a trunk show. There were some fairly large issues immediately - in particular the balance left to right, which was causing the jacket to collapse under the arm on one side. The flannel trousers, which I had asked to have with ‘kissing’ pleats having seen these on Chad, were also rather too small in the seat, forcing those pleats open. At the next fitting in December, these issues seemed not to have been corrected, and this was a pattern that would repeat itself over the next six months. Robin noted the issues, chalked the cloth, took photographs, and made his own notes to send back to the team in Seoul. But at each fitting some changes seemed not to have been made, with Robin sometimes unsure why this was. The jacket continued to improve in some ways, with the length correct and the collar sitting well, for instance, but fundamental issues around the balance and the sleevehead remained, with a fitting in March and then again in June. The trousers proved hopeless. The seat was taken out twice, but there wasn’t enough inlay to do so to the extent needed, and they had to be remade. I’ve had one fitting so far on the new pair. After a fifth fitting in October, I asked for the jacket to be sent to me, so I could at least have it photographed and cover it. The result, shown here, has only two significant issues: the right sleevehead is pulled too tight and as a result creases horizontally; and the front/back balance is a little off, with the back too short compared to the front. The sleeves are also around 2cm too short (probably from alterations to try and fix those sleeveheads) but that can be changed fairly easily. Otherwise, I quite like the B&Tailor style, as I know a lot of others do. It draws on influences from both Florence and Naples (again, as many other new tailors do) with a relatively wide lapel, low gorge and slightly extended shoulder. The construction is very soft, and I’d be comfortable wearing something this casual and lightly padded with jeans. The only thing I don’t like is the slimness of the sleeve. This is always a little restrictive and in fact is not as flattering as a larger sleeve, despite many men’s instincts. As to what has gone wrong with the fitting of the jacket, B&Tailor say they aren’t sure having never seen me in it. Robin says the process would have been different had he taken the measurements initially (though you might have thought five fittings could correct things). Certainly, I can’t recommend the service based on this experience. And while I’ve seen some other good pieces on friends, I’ve also heard some negative experiences. Given the issues, I will likely go somewhere local, such as Graham Browne, to have the remaining issues fixed. Robin charges SEK19,000 (£1,700) for a sports jacket through B&Tailor, and SEK24,500 (£2,200) for a suit (including most cloths). He is usually here every couple of months. Robin has been training himself with a tailor in Sweden, and offers a full range of tailoring under his own name. He also offers bespoke shirts through 100 Hands and a range of custom jeans. In terms of B&Tailor, he spent three weeks with them in Seoul learning fitting with their garments. B&Tailor also work with other remote fitters in other parts of the world. The jacket cloth, by the way, is a really nice yellow herringbone tweed from Holland & Sherry that I was excited about using. I see it as the casual equivalent of my oatmeal-cashmere jacket from Elia Caliendo. It is similarly versatile, working with every colour of trouser except the paler tans and greys. And it manages to be a casual jacket that works with jeans, without being the usual country brown or green (or indeed, anything brighter or more unusual). Unfortunately, the bunch has been discontinued by Holland & Sherry since the jacket was originally commissioned (another disadvantage of it taking so long!). It was 883205, from the SherryTweed range, 100% wool at 11oz. Holland & Sherry are bringing out a replacement tweed bunch in the Autumn. You can follow the discussion on B&Tailor jacket via Robin Pettersson: Review by entering your email address in the box below. You will then receive an email every time a new comment is added. These will also contain a link to a page where you can stop the alerts, and remove all of your related data from the site. I think your issues can be corrected if they use a robust computer system for managing the workflow. Shorter jacket back than front. Isn’t this Neapolitan feature? Most of Solito and Dalcuore jackets I have seen had it. It varies more between tailors than between regions. I have Neapolitan jackets with more or less, and the same for English. Often you want the back to be a little bit shorter, as actually the whole jacket looks balanced when it is. But it’s less than seen here. I caught this statement about Solito jacket from one self-made style experts… Well, Good bless PS! Terry Haste mentioned to me once that Italians often balance the coat to the front meaning the front is slightly longer than the back. He pointed it out on one jacket I was wearing but I never noticed it until it was pointed out (its tricky to see it from a first person perspective). As for that jacket … Im sorry but its an utter shambles Simon. Ive had shoulders which were a bit of a mess made for me before but this is outrageous. The whole thing has little shape, with far too much cloth falling all over the place. Looks like a sack of potatoes! Its terrible and you would look better picking up something from M&S for £250. Seriously. Reading further down I saw the prices and almost choked … £1700 for that? Is that a misprint? Its a shocker. You can almost get good bespoke in London or Naples depending on your preferences. Good MTM at somewhere like AngloItalian is 2/3 the price and they have a fixed premises in an expensive part of London. What the hell are these people thinking! Doing MTM trunk shows and charging that much is just outrageous. They should be tarred and feathered for taking peoples money and delivering this kind of produce. Ridiculous. Interesting how two commenters can say that it’s outrageously cheap.on the one hand and the other outrageously expensive. Clearly neither are true. You state that you would take this piece to Graham Browne for further alterations. I was wondering whether you still recommend them to produce bespoke articles themselves? I am interested in buying a tweed sportjacket, but have a fairly modest budget (around £1000-1200), and they seem a good prospect, based upon your experiences from several years ago. Would you go with them, or another tailor? Russell recently made me a very soft structured jacket in Harris Tweed. Fits perfectly. Very well finished. Well within your price range. A much better outcome than the jacket featured in this article. And he has made me very soft structured jackets in the past too. But I refer to comments re Neapolitan style. English tailors take out all the padding and canvas but leave everything else the same – sharp lines, clean finish. It’s not a style I like – neither one thing nor the other. My comment had nothing to do with Neapolitan style. It was related to the question asked if GB could make a good tweed jacket. Mine is not trying to mimic anything, I just said it was very soft. And why would I want to compare it to a cheaper Neapolitan? I’m comparing mine fro GB to yours from Sweden and saying it is a much better outcome. Hopefully your reader will see my point. Understood. 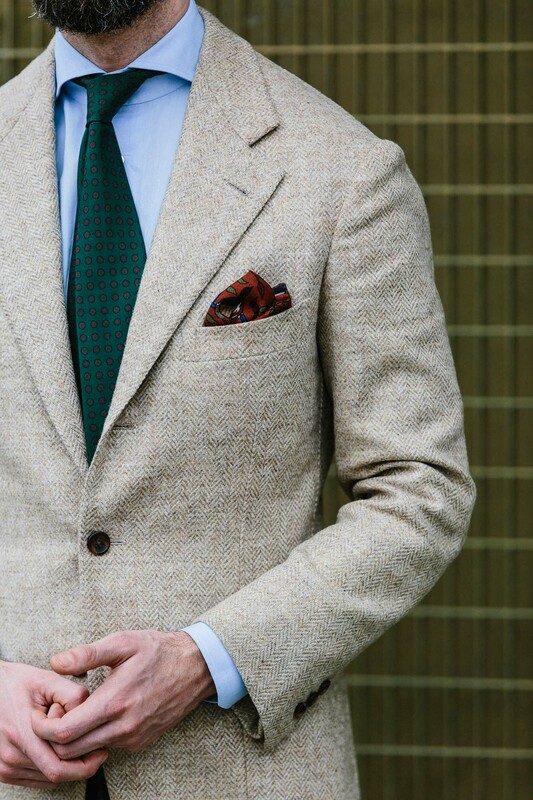 It’s obviously very hard (and a very long discussion) to say what a ‘good’ tweed jacket is. But most people I speak to are aiming for something akin to a Neapolitan jacket when they ask for a soft construction. You clearly were not. 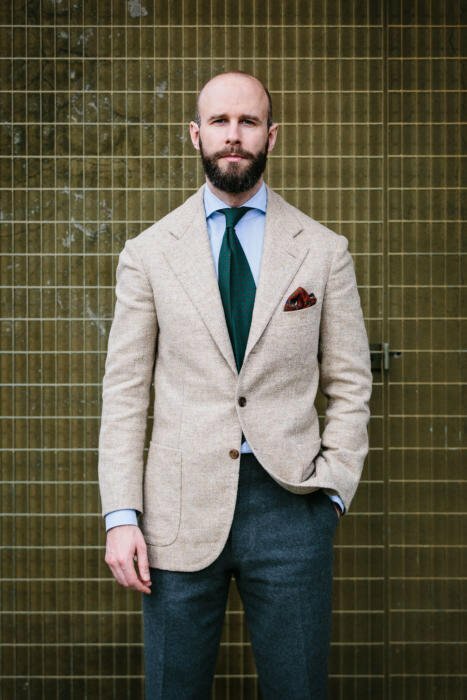 Would you honestly choose a Harris Tweed and then ask for it to be made to look Neapolitan? Absolutely. Neapolitan tailors have worked with tweed throughout history, and some of the most popular pieces I have made over the past few years have been tweed by Neapolitans – see jacket here for instance. As I asked yesterday, Neapolitan tailors using HARRIS tweed? Yes Brian, GB will make you a super jacket for a great price. I know Simon disagrees in the other comments below, but all the same they did a great job for me. Their normal cut was a bit too strong for something to wear with jeans, but a softer canvas and slightly less padding in the shoulder did the trick. Not Neapolitan, but it works. Also worth saying that Dan who did a great deal of the cutting at GB has struck out on his own just now. Will be offering similar value apparently. They don’t have a web presence yet but you can get hold of them here: https://www.instagram.com/macanguswainwright/ . Still based in the City too. I think some of these comments highlight a general issue with the term, “soft tailoring.” Firstly, there are multiple styles that could be described as “soft,” such as A&S drape cut, or Neapolitan, but they are very different in their overall appearance, formality, etc. Perhaps a full Permanent Style dissection of the different styles could be in order…? I was surprised that the result turned out this way. I can certainly see the issues you are refering to but my own two bespoke pieces (Polo Coat and Hopsack Jacket) from BnTailor through Robin has been excellent (the Polo Coat is perhaps my best bespoke commission ever). Both times I had everything from measurements to fittings done by Robin which might have helped out. I totally agree regarding a fuller sleevehead. Does wonders for the moveability and silhuette for the jacket. Thanks Andreas. Yours was certainly one of the positive experiences I was referring to! 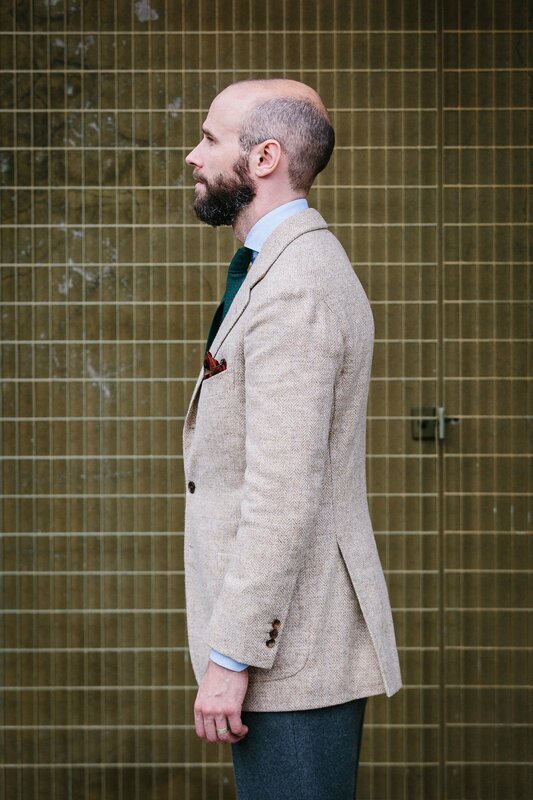 Simon if the sleeve head is too small on a bespoke coat, can it be increased in size afterwards? Im guessing if so its a tricky operation and the tailor may not be keen to do an alteration like this. Simon, what about the make level? Good and clean handwork, probably not Parisian-tailor level but compared to Southern Italian for example? 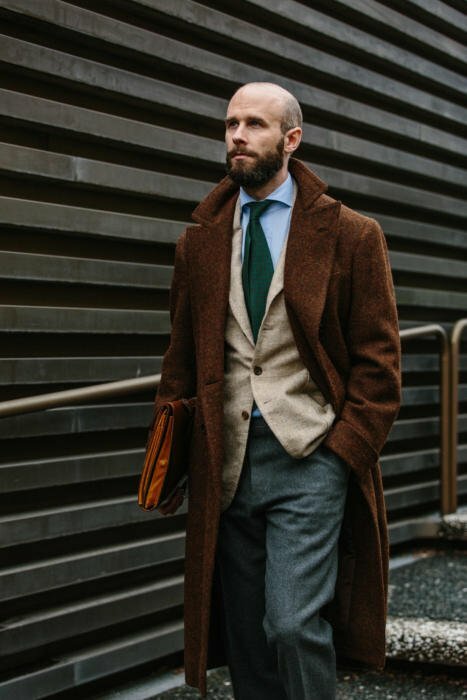 Any tailors you can recommend with a similar cut but without the issues? Given the (relatively) similar style and almost identical price point – is it fair to ask whether you would recommend B&Tailor or Saman Amel, and if so on what basis? Especially interesting because one is bespoke and one is MTM, so it would be fascinating if in this case you had preferred the MTM. I would certainly have preferred Saman Amel, but I don’t think the comparison means much more than that. It doesn’t say anything about MTM v bespoke in general. This was just poorly executed bespoke. The more interesting point, actually, is that MTM is often a more consistent product, and easier to control, because of the systems in place to refine it. Bespoke is wonderful but opens the floodgates of potential in a way that is harder to control for someone without much experience. H … look at the pictures! Why on earth would you consider having something like this made for £1,700. ANYWHERE would be better than that. Just go into Banana Republic or Zara and you’d have a more wearable jacket for £150. I cant believe what I was looking at! I do love the B&T style but I have friend who lives in London, he commissioned a brown tweed jacket with B&T through Robin and after 3 fitting the results were so poor that they gave up by mutual agreement. Doesn’t this reinforce what you have always told us about being fitted by the cutter and no one else? To get it so wrong and so bad knowing an article is going to be written about it …. it beggars belief how careless they’ve been. And I would assume they were given a first right to reply to the article. Maybe they can get past the average Joe by saying ,”Oh sir, that’s supposed to be like that “! But they cant get past PS. Could it be the Korean end didn’t quite appreciate who they were making this jacket for ? Not that it should matter anyway . Who would continue to use this service after this review ? They were told the piece was coming and way it would contain, yes. That is quite underwhelming. Sorry to hear this was your experience. I however think this points out a somehow more common issue with travelling tailors rather than those that are in one’s city. The fit isn’t exactly the best of what you’ve got in your wardrobe and not the most flattering either. I’ve also heard about some inconsistencies in what was delivered. I’m a huge fan of Chad Park’s style nonetheless. This comes rather unexpectedly. BnTailor has been very good and extremely consistent in my opinion, but this back balance is honestly way off. I have much respect for them so it would be nice if an explanation as to why this is. could be offered. The balance being off has nothing to do with the tailor in this instance, as they will only sew based on markings or notes. At home for Robin would be the town of Göteborg (Gothenburg), not Stockholm. Does Robin do any of the work at all btw? Because I have been to his atelier and I have seen him working on some garments there. Is he also doing a bespoke service in his own name, without involving B&Tailor? It could be just the photo, as you have your hand in your pocket, but the right lapel looks wider than the left. I don’t understand how a daft business model such as this could ever yield a good result, and your experience seems to highlight exactly that. In addition, the price is not warranted by the finished garment, which looks pretty awful. Just an odd story really. I think this is the most flattering combo. Where would you place Caliendo and Solito in terms of cut and style compared to BNT, Liverano etc? Caliendo and Solito are slightly different (Solito perhaps a touch tighter, a touch shorter) but they are basically both Neapolitan cuts, which is very different to Liverano and the Florentine style (or Milanese). How drastically do the Florentine and Milanese styles differ from one another? Are these also going to receive coverage in the most recent series on tailoring traditions? Shame on such a beautiful fabric. I’m also a bit surprised, as I’ve read nothing but posivite about B&Tailor in the past. Nonetheless, I will be saving a picture of this jacket for future commision ideas. Is this softer than the oatmeal Caliendo? What makes the latter less casual? The texture. That was cashmere, and plain. This is tweed, and has more variation in colour and texture. This is not very surprising to me as I had a very similar experience with B&T, although it was a bespoke commission in Korea, where the cutter measured and fitted me. I had a total of 4 fittings, with an end result of unwearable, completely off balanced disaster. I was a novice back then, and they tried to convince me that “it was supposed to be like this.” Only after I experienced more tailored garments in and out of Korea did I realize that B&T was not up to its hype. In fact they are not known to be that all consistent or even good within Korean classic menswear scene. To this date, from my experiences including local Korean tailors as well as more renowned Italian tailors, B&T holds the worst bespoke experience. Would you care to share what you deem better addresses in Korea, Seoul in particular? For Napoleatan style jackets, the much better option is “Sartoria Napoletana in Seoul” by Sarto Jun, who learned his skills under the same maestro as Ueki-san of Ciccio but for a longer time (5 years). For a more clean “Korean cut”, I recommend SEGI tailor or Lerici. Do you know Sarto Jun’s price range? It’s about $2000 for a 2pc suit last time I checked, but it should be best if you ask them directly. Seems like a much more expensive version of Luxire, Indochino, and other online ‘tailors’ who rely on the client and / or a salesperson to relay measurements to a workshop in the Far East. At that price you would have several decent M2M / ‘semi-bespoke’ options to chose from here in the UK. As such, I’m struggling to see where this fits into the market? Not really, in that this is full bespoke. All the hand work, hand padding, individual pattern etc. It’s very different to MTM or any of the online brands you mention. But surely Matt is right. What is the point in paying loads more for all the bespoke padding, pattern etc if the outcome is so poor? There isn’t any – but made to measure is also often poor. In fact, more often in my experience. The fact this was poorly executed has little bearing on a comparison of bespoke and MTM. I find it interesting that in many of the expensive bespoke garments you commission there are still so many issues even after multiple fittings primarily due to woeful lack of communication. What then is the justification for the price.? I firmly believe my local 75 year old Italian tailor could do as well for a fraction of the cost. We communicate effectively through a mixture of my broken Italian and his elementary English with the inclusion of occasional hand gestures. It seems the client is paying an unreasonable amount for the cachet of the “name”. This kind of issue with bespoke tailors is actually fairly rare – the majority of mine have none of these issues. I think it’s just that when there are bad experiences, they cause a lot of fuss. On the last point, interestingly I actually find that such issues are fair rarer with the big houses (the likes of Cifonelli, Huntsman, Panico, Liverano). They have established systems in place, experience dealing with lots of things, and usually good internal management. It’s the smaller and less experienced tailors (not to say those two things always go together) who can struggle. On average, the bigger tailors I have tried have delivered a better, more consistent product. But that’s something it’s hard to tell someone they’re paying for. I don’t understand this comment as it isn’t supported by what you have written here. For example, your disappointing experience of the unsatisfactory Huntsman shooting jacket is a classic blog and you have also written that you haven’t used Panico and didn’t intend to. There are certainly examples of where large houses haven’t produced great things, but on average I think it’s true. They also tend to make fewer mistakes or miscommunications during the process. The sleeveheads (right side in particular) aren’t just tight, they are an unmitigated disaster. This doesn’t even approach good enough for a ready-to-wear jacket in terms of fit. PS: Loved the review, but I feel sorry for Robin. He’s definitely NOT a charlatan and I love what he did for Andreas and for the guy from Blue Loafers. But I totally agree about the issues. Thanks Patrick, and I completely agree re Robin. Would you mind posting this on the actual post about the suede jacket? Otherwise posts about different things are scattered all over the site. A depressing read only lightened by the picture of beautiful Liverano Ulster coat at the end. My guess is you are not a poker player as your face gives away your feelings towards the two garments. All serious (even frowning) for the BNT jacket and all smiles for the coat. However on a more serious note, it shows that sometimes you have to walk away and bring in someone you trust. Simon, love your overcoat! What fabric is that please? Harris Tweed from Holland & Sherry. See full review here. Like most of the comments offered I’m surprised by the result of the review as I have heard good things about them too. As I live in out in Asia it’ll be interesting to hear what you have to say on WWChan should you decide to review them since they also participated in forum lately and together with B&T both kind of represent Asia in term of genuine fine tailoring houses. This is undoubtedly the first time i see you wearing a jacket that looks so bad. The back is a nightmare. Look at those ridiculous Shoulders! Straight to the bin ! I have a couple of questions. How will GB charge to deal with the outstanding issues? It seems that you have given up on B&Tailor. Have you paid full price for the jacket or have you negotiated a discount? It would be outrageous if B&Tailor charged the full price (or close to it) for such a sub-standard service and garment. Best of luck with sorting that dreadful mess! They offered to make it with no charge. GB will probably charge for changes. Not that either.makes any difference to anything. – The front/back unbalance does not strike me, I could see it as stylistic choice. – One of your Chitleborough & Morgan suit seemed to have a tight, drapeless back. Was it not an issue when moving? – Regarding tight sleeves, is the frequent issue due to too small armholes, sleeveheads or tightness at the upper arm level? You mention some light padding in the shoulder. 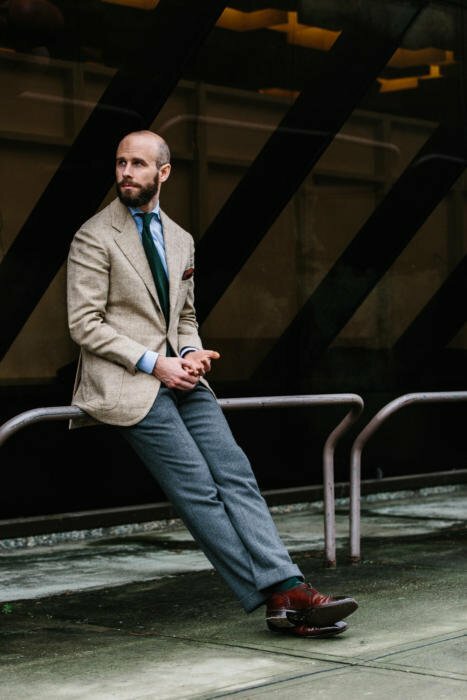 Did you opt for a spalla camicia construction for this jacket? If it has padding in the shoulder, it can’t be spalla camicia. I think you mean roping in the sleevehead, rather than padding in the shoulder. The terms aren’t used entirely consistently, but when most people say shoulder padding they mean the padding along the top of the shoulder, not in the end where it becomes the sleevehead. But you can have a spalla camicia construction with roping anyway if you want. Sciamat do this. You confirmed earlier that the shoulder was lightly padded, which means it cannot be spalla camicia construction. Looking carefully, I would actually describe it as con rollino. Again, the padding of the shoulder (not the sleevehead) has nothing to do with spalla camicia. And on the sleevehead, I’m pretty sure spalla camicia refers to the cloth of the sleevehead appearing to run underneath the cloth of the shoulder, rather than on top of it. You can then finish the sleevehead in a number of ways – without any little ripples of excess cloth, with them (what most people think of as spalla camicia), or with a little roping (con rollino). You can also have the padding itself extend into the top of the sleeve or not, which also affects how the shoulder looks. Sorry Simon. No padding. Giacca Napoletana. No padding. OK, let’s leave the discussion here. I think we’re talking a little at cross-purposes, or language is getting in the way. Hi Simon, I think there is another issue here. I love the fact that you test different makers so regularly – it makes for great reading. However, I have settled on one tailor on the Row for structured garments and one in Italy for ‘softer’ work. The more each tailor makes for me, the more they hone in on my perfect cut and fit. Despite the quality of workmanship, in both cases early garments had issues, but as we have got to understand each other better the cut and fit has improved with subsequent commissions. I think that because you often have ‘one off’ garments made for review, the tailors involved don’t get that chance to improve with subsequent items. Please note that this is a general point encouraged by this post but not necessarily specific to it. I completely agree, and I would always recommend readers use more like 2-3 tailors, as you describe. Thanks for sharing your honest review. I just ordered a piece of garment from bntalior during their last trunk show. The good news is that it was and will be fitted by Chad. Finger crossed for a better outcome. Ha, I’ve never seen you so unhappy with a commission and justifiably so. Thank you for the honesty – a shame that this has not worked. It would have been nice to see a good result as the choice in colour and cloth make for a sophisticated and elegant ensemble (As such any chance of seeing a repeat commission of garment but with another maker – Russell is very good but even he can’t work miracles…). Fit aside the end shot (with coat) shows what a great outfit this might have been. Thank you for trying another interesting offering but, given results, might it be time to see if a closer tailor (vs. Asia based) might provide you with the results you seek? Why not post pictures of the coat after Russell has done your alts? I recently got a couple of things made by B & T via Joe Ha. They are very well-made compared to the other stuff I have (Northern Italian and Neapolitan). The sleeve head of mine is larger than any of the Italian stuff and it is a slightly looser cut with high-waisted trousers. It took many, many fittings (Joe is a perfectionist, and I have many suits so wasn’t in a rush, though I would have been happy with 2 less fittings): however mine fits very well (I’m sorry, but I don’t think that yours does). It is probably the most comfortable stuff I have. Not a bad option at all if you are stationed in the Far East or the Colonies. I’m curious Simon, after reading all these negative comments, do you really feel the jacket is as awful and unwearable as many are making it out to be? Clearly the right shoulder has issues, and that shouldn’t happen in bespoke, but besides that do you feel the comments are being too critical? Good point. No, I don’t think as bad as that. The bigger issue was the process. It’s still not great, and I’d still ask for it to be corrected, but the number of fittings to get to here is the biggest issue. No news of your Formosa? The last time it seemed to follow the same result. Thanks for this post! Obviously, a teaching moment. A style point related the trousers: you did mention having requested “kissing pleats”. I simply can’t figure out what kind of pleats these are. Please, could you elaborate on that? I think it is a forward and reverse pleat facing each other, joined at the top? Sad to hear that you are not pleased with this commission Simon. I have a jacket and trousers from BnT through Robin (and a some stuff in the making) that I’m very pleased with. I (like Andreas) had my Initial fitting with Robin directly. Among the Korean tailors i’ve tried I find BnT’s work to be the best. Also I must say that the aesthetic is flawless. So disappointing to hear this, the suit made for the Blue Loafers guy looked great…at least on instagram! I was seriously considering them too. You quote a price in the article. Is that what you paid, or is it what you would paid if you were to have it made by the fitter himself? Because if you paid £ 1700 (plus VAT? including VAT?) for a jacket made half-way across the world by someone outsourcing their fitter, you’re pretty much asking for disappointment. When the price doesn’t match the product, whether up or down, there’s always something wrong. You’ve lived in Hong Kong, and you know what I mean when I say this reminds me of the infamous ‘bespoke’ £ 100 shirts ready in 2 hours. Or the ‘bespoke’ £ 300 suits ready in 24 hours. It just doesn’t add up. That being said, thank you for this reviews. Better you than me, what? I see. In that case, I really think you should have stayed off this particular commission. £1700 is way too much for a remotely-fitted jacket made offshore. Beautiful tie as usual, loving it. Simon, rather unrelated and maybe something you’ve already covered, would you please do an article on the relationship between shirt collar and face shape. Am struggling on that one, please mate. This review has only encouraged me to come forward and share my view on experience of BnT via RobinPett. – product is overall average in quality and finishing. Blueloafers and Andreas were lucky somehow and this was inspiration to get my commission done. – indeed, overall process took over 1 year and lots of details have not been communicated via Robin to Korea. Is it Robin not taking or passing the notes or is it the Koreans not paying attention? No idea, but the customer suffers in the end. I still like the feed of Chad and BnT, but will I give them another shot after this order – highly doubt it. I have made several pieces from B&Tailor through Robin and everyone single one was excellent so “lucky” is not really fair in my opinion. Sometimes tailors get it wrong and like it or not but it happens regardless of the business model and size of the tailoring house. In fact, I don’t know a single tailor without a few major f**k ups over the years. I agree regarding the issues in Simons case and I applaud the honesty of the review but I find some of the comments a bit unfair. There are tons and tons of excellent results from B&Tailor made both with and without Robin so I don’t think it’s worth completely rejecting them or the business model based on one result. However I do agree that customers should expect more and if I were in charge, I would insist on remaking the jacket from scratch since most of the problems seems to be associated with the first measurements. The jacket looks ever so slightly too large around the shoulders. The shoulder line is clean but the sleeve head maybe a touch too big? Also, the cut of the jacket makes it appear as though you have unnaturally sloped shoulders. Having been to B&T’s shop in Seoul, and having lived there for over a year, I have found that there are chronic issues with fit among many Korean tailors. I cannot judge B&T’s work, as I have never commissioned a jacket thru them, but I do believe the work coming out of Jeremy’s shop (cheekily named “Knockers”) is far better. I dropped you a comment earlier but it seems to have got lost. Asked really why you would get a soft, unstructured Napoli to make something with a coarse, thick Harris? But when would you get a jacket made from canvas to wear in colder months? Did you mean ‘where’ instead of when? Or ‘why’? When I read this it makes me cherish my relationship with A&S even more. To go through all of this for such a sub standard result is beyond the pale. Thankfully we have Simon to make our mistakes for us – one of the great beauties of this blog with its multiple commissions. On a positive note, has anybody seen ‘Phantom Threads’ ? Day-Lewis achieved sartorial perfection. Are you planning to test out Shibumi’s Su Misura Offer? Why not get BnT to address the issues until it fits? I would have thought they should be obliged to……. They don’t travel to the UK, so the only chance of seeing them is perhaps meeting at Pitti if they go. The initial excellence has never been replicated. The pieces are not comfortable to wear and most have been returned for alteration. And I fear that I have spent a lot of money and will be left with items that I will not wear because the fit will never be right and won’t be rectified. Reading through the comments here, as always, one needs to not adopt a binary or dichotomous position. Mikolaj and Andreas’ experience is at one extreme; yours (and perhaps mine) at the other. Robin is absolutely charming; he has tried his absolute very best and I await the return of several pieces with the rather high hope that it will all be resolved – but my fear is that I may not be comfortable in what I had such high hopes for and this review only cements that. So, rather than focusing on vitriole and negative comments, my genuine question to fellow readers and you Simon, is what does one do when in the predicament of receiving bespoke commissions that are not what you’d hoped for, where the fit isn’t right and when you’ve had in excess of 3 or 4 fittings over a year or more. What is reasonable to ask for? When do you reasonably stop? What should you expect the tailor to do? How do you negotiate a review of the costs? If you decide to keep the pieces, where are the best London based tailors who can be approached to rectify things? Answers to these questions will make this review and the comments extremely useful to the less seasoned buyer than many of you, and would be extremely valuable. This cannot be an unique experience and advice about the approach to resolving it would be very much appreciated. Thank you Mike, a very balanced and useful report of your experiences. On the question of what it is reasonable to do, I certainly think you should expect significant improvement of your pieces at every stage (and if this isn’t happening, stop). The tailor should also hit their own expectations and predictions – eg if they say they need four fittings (Joe Morgan might) then you will allow that, but if they say it will take two and you’re on four, you have a right to start making demands or ultimatums. In this situation the usual practice of only paying half the cost of the suit in advance and half on completion is useful, as it means you can at the very least withhold final payment and not accept the finished garment. But I can see some would argue you should be able to get it all back. Negotiating to pay less if you want to take the piece and have it rectified locally is harder. In either case the tailor will have done 95% of their work and costs. It’s not an easy one, as in the end it’s a moral choice as much as anything. I’d be interested in hearing the (equally balanced and reasonable) thoughts of others. Withholding the last half and not accept the garment also means you’re down 50% of the cash amount without anything in the end. Have you actually had such cases? Didn’t it make you go mad? No matter what tailor you go to, every single one of them will have had issues with a product wether it be bespoke or MTM, it’s just you don’t always hear about it. I find articles such as this hard to stomach as these tailors you write about (robin, Chad et al) are just doing there bit and have produced some extremely nice Garments from what you can see on social media, however, on this occasion it hasn’t seemed to work out (for most tailors you aren’t really an ideal shape and sometimes when you start anything from scratch it won’t come out perfect the first time!). It’s a shame as you have such a cult following on here it will deter a lot of people from using there services from what I can read above. All I will say is that don’t be sheep, go and commission your pieces from robin or whomever, take that punt as you would with any bespoke service, and I’m sure if it doesn’t end up as one would want it to the tailor would be happy to continue to make amends until you the client is happy with the product. Simon would it have not been prudent to wait until the jacket was right and finished before insisting it to be sent so you can take pics for your blog? And then you can right a scathing review but at least let the product look as it should even if it took them an extra few weeks to get right? It’s not as if your in any immediate rush for new sports jackets from what I can see. First, it is hardly a scathing review. I think if you read it it’s actually very balanced and measured. Most others seem to see this. Second, as described, the jacket was barely getting better. It should have been ready after three fittings. I think it’s quite reasonable to ask for it after five. Third, Robin and many others are absolutely trying their best and doing very good work. However, there are also many readers who are considering spending thousands of pounds on a handmade product, often a huge amount of money for them. I think there is a responsibility for those with a voice to report in a very balanced way on negative experiences as well as positive ones. Particularly when it had this many problems and was not an isolated experience. You say it isn’t scathing but it’s a pretty poor review of there services in this one instance. So your keeping the jacket as it is in a not very wearable condition or will you send it back to BNT for another series of alterations? I appreciate you had 5 fittings but to my knowledge there are some Savile row houses that take as many fittings as that if not more and can have a wait time of up to 8/9 months for some commissions, after all it is bespoke and these things take time to get right regardless of time or the amount of fittings. I get people are apprehensive to spend money on the right tailor and a lot of money it is. But let’s not forget people were taking risks and commissioning suits long before this blog and I’m sure they will be doing the same for a long time after to. BNT looks great and I’d be happy to commission a piece from Robin and give them time to create a piece individual to myself. Thanks. It’s probably a poor review, but as I said there are only one or two major issues, and I acknowledge I’ve seen good things elsewhere. It’s really the comments afterwards that are extreme. As mentioned in the post and comments, I plan to take it to Graham Browne to change, given I cannot meet BNT in person and it’s hard to have any confidence the jacket will be improved after so many failed attempts. Some on the Row such as Joe Morgan do ask for lots of fittings, but BNT usually do not. They said it should be ready after two or three. Bespoke is certainly always a bit of a risk, and all tailors have minor issues, but it’s hard to see why any consumer would not want open and honest communication of all of them, particularly with so many new tailors setting up. Thank you for another insightfull and balanced review. Quite incredible the reactions it has elicited, both those vilifying bntailor as well as a militant response defending this particular brand. I think your experience shows the risks involved in using a proxy between customer and cutter, especially when the distance crosses continents. As my shape is somewhat similar to yours, I will not be commissioning a product with bntailor as I had planned, based on your experience. At the same time it is clear from a prolific social media presence bntailor is capable of producing beautiful results given the right circumstances. The biggest disappointment for me in this whole situation is the response from some of my favorite social media actors. Instagram has been inundated by beautiful straight-up-and-down pictures of bntailor products from the likes of Olof, Andreas and blueloaferguy as if you review is something that needs to be discredited. I Find the activity from these blogs/writers rather disingenuous and reflect rather established friendships than a concern with quality tailoring. We are all interested in building a vibrant and high quality international bespoke industry. In the case of a bad experience we should embrace and learn from this, not make excuses. As a final thought I would reject anonymous posts in the future. My aim was never to discredit Simons review. I’ve stated several times that I find it excellent and honest. There’s no doubt regarding the issues and I don’t think Robin or BnTailor would disagree. My post and objection was aimed at the comments who reject (or praise) a business model or tailor with certainty based on a single result. The reason I commented was because my experience with BnT/Robin indicated that Simons result was not representative of their normal standard. It’s not about friendship but rather adding a bit of balance to the discussion. I’ve had bespoke made from highly regarded tailors that had major issues during the process and took as many as 5 fittings but it was not representative of their work either. Rather a potential downside of bespoke and the human factor involved. As much as I like reading and writing bespoke reviews, it’s impossible for someone else to be certain they get the same (good or bad) result. Just to add to the mix, I have no connections financial or otherwise to B&Tailor and can attest that I have had one beautiful jacket made by them (fitted by Chad through Notice of Appearance) and a second one being made now which is even better than the first. Just one experience but wanted to throw it out there given the number of negative comments. Darren Beaman, the “Savile Row” tailor who apparently left dozens of clients in the US without delivered products has made claims of having “consulted” Graham Brown as a pattern maker etc. and also trained their staff – in Lithuania or Latvia. Is it true that Graham Brown do produce also there as Beaman claims to have been there on their payroll – the impression was always that the products are all entirely made in the UK. Amazing how these bizarre rumours pop up on the internet. GB clearly makes everything in London / Essex, with trousers and finishing on coats done in their expanded workroom downstairs. Simon, I think you were meaning to write about GB’s coatmaker workroom in Essex and the new basement facilities. When should we expect a post on this? Thanks Simon. What “new tailor across the road” are you referring to? Beaman is perhaps the most discredited tailor in living memory. Simon do you think Russell will survive? Gives the trade a bad name constantly. He Should be banned from working. Since you and the BnT guys usually visit Pitti, why not have them take a lot at it in person then and see if they can rectify the jacket? Can see the Swedish influencers out in force defending here and on insta…. They don’t like seeing their mate getting a bashing. Personally I don’t have an issue with this; the jacket Andreas posted looks great, and he has every reason to be pleased with it. I think it’s interesting to hear about other men’s experiences and Simon himself acknowledges that he has seen good pieces on others. Just a shame the quality seems to be rather inconsistent. As for the finished item, the arms are definitely a problem, but some of the comments here are over the top. Calm down gents, it doesn’t look that terrible, and the fit is still better than 99% of the jackets you see in most offices! One thing I notice though, is it gives the impression of very sloping shoulders, which I agree is a bit unflattering. Looking at their Instagram feed, there’s quite a pronounced shoulder slope on many of their other pieces (even the one Andreas posted.) Do you think part of the issue is the house style not being quite right for your body shape? Unfortunately, I have to agree with Simon’s review on Robin’s work. This is by no means an anomaly, unlike what some influencers (who were given huge discounts or had jackets/suits made for free) might claim. I have had my own commissions refunded, and I personally know of two other ex-clients who are getting their commissions refunded, simply because the product was unwearable at the end of the day. Despite promising to be in London every 6 weeks originally, Robin comes once every 3 months. It took more than a year to get the finished product after 3 fittings, and in the end, the armhole was lower than all my other suits from other tailors, and all my other RTW suits. the back was cut so tight as well such that simply raising my arm was not possible. I personally experienced an issue with processing the refund. Robin was extremely slow in processing the refund despite his repeated promises that he would make the transfer “today”, “by the end of the week”, or “by the end of next week”. At one point, he even claimed that “oh I made the transfer, but it didn’t go through”. This was all, needless to say, extremely frustrating. One of the two clients mentioned above, is still in the process of chasing Robin to make the transfer. It is quite clear then, that 3 weeks of boot camp in Korea does not make you a skilled fitter. The case of the lengthy refund pursuit unfortunately casts doubts on Robin’s modus operandi as well. you should put your name up rather than staying anonymous. if what youre saying is true there is nothing to be ashamed about in doing so. not doing so ppl may think your a competitor etc. Anand, thank you but to be honest I disagree. It is the substance of the comment that matters, and it’s easy to just make up a name anyway. It’s nice if people put their name, but we should never pre-judge an anonymous poster in the same way we should never jump to conclusions about a tailor or anyone else. Just to be clear – I have never received any garments from Robin or BnTailor for free (quite the contrary) and have never been paid to promote them in any way. I simple believe they have a beautiful house cut and I was pleased with how my commissions turned out. In response to the poster who asked about refunds for sub-standard work, your rights in this area are quite clearly defined by the Consumer Rights Act 2015 (assuming we’re talking about a UK tailor). A customer is entitled to a full within 30 days of purchase for any goods which are deemed to be faulty, poor quality, or not as advertised. Clearly, if this is an issue with fit, then the definition of ‘poor quality’ is likely to be open to some interpretation. Customers with major and obvious issues are likely to be on safer ground that a tailoring nerd who’s annoyed with the angle that a lapel’s been cut at. If the tailor won’t pay, or is dragging their feet in issuing a refund then there is a fairly well defined process that consumers can go down, ultimately leading to the door of a Small Claims Court (which can arbitrate on disputes up to the value of £10k). In my case, which involved repeated attempts to recover a deposit for a suit which had still not been delivered 18 months after ordering from a reputable ‘off-Row’ tailoring house, the eventual threat of formal legal action was enough to put a rocket up their backsides and get me my refund. Obviously this only applies to UK-registered businesses. Ultimately, if you decide to hand over a substantial chunk of money to an overseas ‘itailor’, based on the recommendations of paid-for or subsidised Instagram content, then you’re taking a massive leap of faith in terms of the quality of the end product. I am saddened to see this. I love what they post on their social media, but it is easy to fit a mannequin, not so easy to fit a living person. Someone sent me a couple of B&T garments to look at because they had had a similar experience with an outside fitter- the garment was just unwearable so he sent it to me to dissect. The workmanship of these particular garments is remarkable and I was hoping his experience was a fluke. Of course the fitter is the key and B&T can’t be held responsible for what an outside fitter might do; I will have to look for more examples of their own work done in house. But in the meantime I will unearth my seam ripper and camera and show the insides of the garments that I do have. Hi Simon, was hoping you can provide some advice on folding a unstructured jacket when travelling? Thanks! Thanks Simon, that will be useful! Though the fit may still be imperfect, I absolutely love the cloth of this jacket! It’s so wonderfully casual yet smart. Exactly the kind of jacket I would see myself wearing over and over again! Thanks for your honesty Simon. It’s not easy when you have such high hopes for a product and have this type of experience. Unfortunately in the last 18-24 months we seem to be hearing more and more stories of men being disappointed and let down by their experience with tailoring generally. 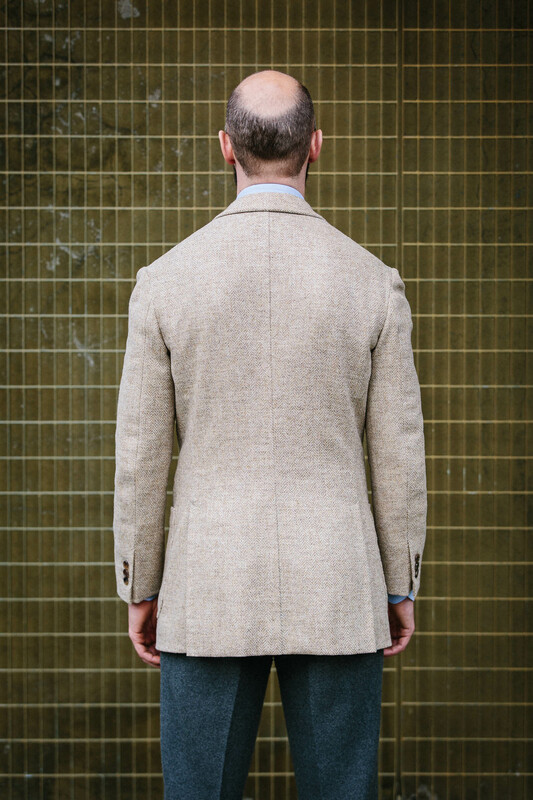 As one of the owners of The Cloakroom – a business that is almost exclusively made to measure in our offering (we only do 15-20 bespoke commissions per year) we have been at pains to try and redress some of the lost faith in our industry, and have tried to be as evangelical as we can in promoting the virtues of tailoring when it is done well. Running a business with tailoring as its core offering is not easy, and especially so when it involves suppliers and production in different countries. As one of the few non-Japanese brands that have their suiting made in Japan we are often reminded just how fortunate we are to have developed the program we have with our team there. Working with such expertise has enabled us to achieve a consistency in product quality and timeframe that we didn’t think possible. Sadly it seems these two things are lacking in many tailoring businesses. While we don’t service the major suit market cities (our stores are in Brisbane, Montreal and Tokyo) we are constantly encouraged by the interest that publications such as PS generate, especially among men new to tailoirng. It’s not an easy thing to navigate your first few commissions and know what to expect. I’m sure you are all too aware of how much trust your readers place in you, and the weight that this carries with every review you make. It must be a challenge to balance this when things don’t go well. To add my 2 cents to the discussion. I’m generally quite pleased with the product fit and finishing wise. I got what I wanted and at a competitive price where I feel that it’s hard to justify going for a more established house. However, whilst robin is a nice guy i feel that if you are a “just” a fitter, the customer service and client centricity becomes even more important – especially when the garments are made overseas. Unforunately, i feel this is where robin and others fall short. The bottomline is that if you are paying a substantial amount for a garment and the associated service, everyone deserves the same level of service and attention to detail. Im not sure this is always the case and it’s extremely frustrating when fitters don’t take notes and then your garment has the wrong buttons or you send them a style reference to aide the tailors and you see they never viewed the message. It unfortunately communicates a nonchalance that i dont think anyone deserves when they spend this sort of money on a bespoke garment. I can also echo the point made about frequent london visits. That looks like a wonderful color! I love the depth of color and weight, like a real tweed! I’ve recently just received my MTM BnTailor suit, and I’m experiencing the same issue as you in that the seat is tight and (single) pleats are open, along with tightness at the shoulder. I hope you are doing well. I am deeply saddened to see the new 2018 F/W SherryTweed collection lacking this specific shade of yellow/oatmeal shetland wool that you have reviewed on this post. This shade reminds me of your Caliendo jacket in that beautiful oatmeal cashmere/S170s. Thank you – this color was truly a work of art. I don’t know why they couldn’t see that. Several months later… I have to say, ‘Buyer, beware!’ This product is not consistent. Instagram is nothing more than an online tailoring PR machine (why is that a surprise? ), which should be treated with extreme caution (Mikolaj and Andreas, you both need to be extremely careful about what you support and stand by) and some standards need to be adopted by travelling artisans that secure your customers for years to come. BNTailor have failed on this across the board making their UK offering nothing more than my buying a suit from a tailor in Vietnam, whilst I’m on holiday. The whole internet tailoring fraternity need to rethink what they are doing and agree some consistent standards that mean that customers like me will ever come back to you. Time for a consensus on standards which will build consumer trust again. Simon – if you do anything meaningful, this would be worth its weight in gold if a standard could be established which artisans sign up to and establishes consumer trust. what has been your latest experience Mike? More than 6 months since the last visit. A suggested visit to London last week which didn’t happen and I am still without several suits, which I also suspect won’t fit properly. It’s now close to 2 years for some of the pieces and I’m so disappointed, I can’t begin to express it! It unfortunately has the quality of a scam. I have now had to ask for the suits to be sent to me and to take them to a decent tailor to get them sorted out. They were apparently being sent on Monday this week but no sign of them. I just couldn’t possibly recommend this to anyone – in fact, I actively do not recommend it. I’m unfortunately in a similar position to you with an undelivered garment from the last London trunk show and a promise to ‘have them sent’ (as well as difficulty even reaching Robin). Have you received anything yet? Thanks for the response Mike and the link. Unfortunately I am also thinking of how to escalate the matter (I’ve been researching various UK/Sweden/EU Consumer agencies for any dispute resolution processes). I did not think of contacting BNTailor to at least confirm if the items had arrived. May I ask how you reached Chad (I’ve tried his Instagram/Facebook/website email but wasn’t sure if there was a more appropriate way)? I was wondering if anyone had any updates regarding contact with Robin or success in pursuing a claim? I’m a London customer that commissioned something in January 2018 and managed to see Robin in September 2018 (although this wasn’t straightforward either) but have had no reply to correspondence via email, instagram or WhatsApp. I wonder if it would be possible to collect the names of customers with outstanding orders and approach B&Tailor as a group to see if they are able to make good. Robin blames B&Tailor for delays when I saw him in September but it sounds like the issue may be at Robin’s end. However, I don’t want to hijack the comments section, Simon. Suit coats posted without trousers and still waiting, months later and years after the original orders despite multiple emails to Robin… the last of which hasn’t been replied to. B&T get back within seconds. I don’t think the problem lies with them to be honest. Robin – please can you sort this out, sounds like you have a lot of customers who haven’t received items. An apology or explanation would be nice. Or a refund! Worst decision I ever made. An update from me if that’s ok, Simon. I managed to get hold of Robin’s mobile phone number from a former colleague and spoke with Robin. He seemed perplexed that I’d been trying to contact him vi e-mail and Instagram even though all our limited conversations to date had taken place this way. He said that telephone contact was always best for him despite the fact that he’d never supplied me with his number (the number listed on his website is dead but I now realise you can get his mobile from the Google information panel by googling “Robin Pettersson review”). He said he was going to arrange trunk dates very shortly. When I pushed him for something more concrete he said he hoped it would be February. I’ve also contacted Chad of B&Tailor (via Instagram) who was apologetic and informed me that they’d not heard from Robin for a few months either. They believe my jacket is with Robin. Chad asked me to keep him informed. I think I will wait until February to see if Robin does follow through although I’m not hopeful as his September 2018 trunk shows were supposed to take place in March/April. If Robin doesn’t visit I will ask for a refund and I will refer him and Chad to this thread to highlight the other customers that are unhappy with their commissions. I too am a London customer who had a B&T suit commissioned via Robin, late 2016. Though things didn’t go quickly (I was also out of the country during 2 of his visits) I enjoyed the process and found Robin to be friendly and knowledgeable. My final fitting was Jan. 2018. Very happy with the jacket but the trousers needed some minor adjustments; they were to be posted 2 weeks later. Now, more than a year later, I still haven’t got them. I have e-mailed Robin many times and on occasion he responded promising to post them the next day and even offering a free pair of jeans for the inconvenience. Lately however there has been complete radio silence. I’m not sure what to do….shall I have another tailor make me trousers in the same fabric? This was to be my first bespoke suit. Now I have a suit jacket that is wearable-ish with odd trousers, a headache and regrets. To be honest I hate having to go public with this but Robin has had so much opportunity and time to set things right or at least get back to me that I see no other option. I’m very sorry, I’m not sure what to recommend. At the least, it might be worth trying to buy the same length of cloth for the trousers, so you can make that in the future if you want to? And it’s a less expensive step than having the trousers re-made. I hope it’s ok to provide an update on this for anyone interested. February came and went without any word of trunk shows from Robin. I have since managed to get hold of him over the phone and he has said he will refund my deposit – we shall see if it materialises. I’ve told Robin that if I don’t get anything soon I will file a claim with the European small claims court – I don’t particularly want to go down this route but I figure it’s best to do that before March 29th! I’d also encourage anyone that paid by credit card to look at chargeback and Section 75 legislation which may be helpful in getting money back from the credit card provider following non-delivery of goods. I’ve also been messaging Chad via Instagram who is upset by the situation and very apologetic. There are some language issues but it sounds to me like they haven’t received money either and whilst they say they are trying to resolve the matter they have also said that there was nothing they could do because they can’t contact Robin. I’ve sent Chad a link to this article and suggested he may want to provide an update as I wasn’t the only one that had been let down. Good luck to anyone that’s still hoping for garments/money from Robin. I’d certainly appreciate any updates from anyone clinging on out there! I have also been in touch with Chad who is equally annoyed by the situation. In addition, I have consulted other B& Tailor representatives to seek their advice and this is even impacting their business. Apparently all garments are with Robin and as mentioned above he seems to the bottleneck here. Simon, is this something you could comment on? Have you had similar experiences? I hope it’s ok to provide an update, Simon. After weeks and weeks of trying to get something from Robin I did (very politely) suggest to Chad he might want to consider offering a refund to London customers as, in my view, Robin represents BN. Chad didn’t share my enthusiasm for that idea. Chad then asked me for my name and order details again (which was odd as we’d been communicating for months and I’d given him this information before) and he informed me that no order had been placed by Robin in my name (again odd because Chad had previously said my jacket was with Robin). I asked Chad how that could be possible as I had a first fitting of my jacket with Robin in a trial cloth back in September. Chad informed me that BN don’t do trial cloth fittings for garments abroad. He also asked if I was sure I had ordered a BN jacket and not a Robin jacket! It was certainly a BN trunk show when I ordered the jacket but who knows what I was trying on at the first fitting. I have spoken to Robin a few times on the phone. He’s not easy to get hold of as you can imagine. In the past four weeks he’s refunded my deposit three times (one time even going so far as to send me a screenshot of what looked like a bank confirmation). Alas, Anglo-Swedish banking relations are not what they used to be and each transfer seems to get held up by some invisible issue. Most unfortunate. If you look at Robin’s Instagram he is no longer RP tailor but a denim maker. However, in conversations with Robin (and he’s disarmingly friendly on the phone but never apologetic) I am led to believe he is working for a brewery. So, I think the only recourse is legal action through the small claims court. I’ve told Robin this will be my course of action on a number of occasions and it does spur promises of a refund but it never materialises. Good luck to Anonymous and any other folks! The whole operation sounds like a complete business mess. Reading between the lines I would guess they can’t issue refunds as there is no money to do so. If you have a garment where say costs of manufacture + shipping + logistical trips for fittings add up to 75% of price paid there is only say 25% profit. With all the remakes, running up costs in travel for these surplus garments, shipping, and then perhaps paying the factory for the remake (due to the factory being unwilling to do adjustments without pay) any profits left may have been whittled down. In addition with the bad publicity around this they probably aren’t getting new orders and therefore there is no cashflow in the door. The fact they are still engaging with you a few months back and promising a refund although not processing it tells me they are probably not scammers. They just don’t have the cash. Result for you is even if you Sue one of these parties and win they might just have to declare bankruptcy and wind the company down. You need to check who you did the business with exactly. Did Robin act as a company taking your money? Or was he just like a rep taking money for BN? Depending on who your ‘contract’ was with is where liability lies. Anyway, whatever happens my friend learn a lesson from it and move on. In a business which requires skill and craft choose experience over youth and enthusiasm. As Ive said before on this blog I think there’s very few good bespoke tailors out there. Im not going to go through names out of respect for the blog, but some esteemed tailors produce a sub par product, with no flair at all. Its a dying craft whatever the blogosphere might indicate. Either hunt down the few good ones, at great expense, or just go to decent ready to wear. Hardly anyone will judge you for it or really care. GL. Still can’t stop drooling over the yellow sherry tweed fabric. I’m assuming there’s nothing like it available? Any way we can get H&S to re-release this specific color? Not that I’ve seen, no.